Hire or buy a refrigerator! Allcool Refrigeration GmbH, founded in 2001, hires out refrigerators and freezers for all kinds of trade fairs in Germany, and for some trade fairs in Europe. 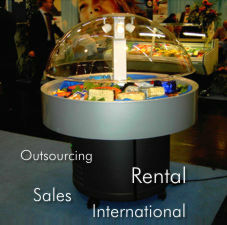 So that we are always able to offer you cooling devices in excellent condition for your fairs, after several uses (i.e. after being hired several times) our appliances are offered for sale. Of course, we also offer a range of brand new refrigerators and freezers. Enquire about our brand new or used chiller cabinets, cooling counters, refrigerated or freezer islands, refrigerated wall cabinets, freezers chests and cooling domes, or head over to our online shop for a rummage whenever it suits you. If you can’t find the device you’re looking for, please give us a ring.